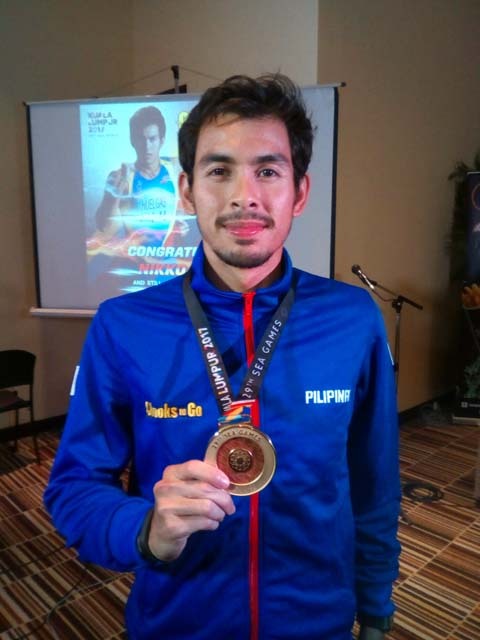 Nikko Huelgas: The Face of Philippine Triathlon | JustRunLah! Two-time SEA Games Triathlon champion Nikko Huelgas (PHI). FOR NEWLY minted Southeast Asian Games Gold Medalist Nikko Huelgas, he is more than willing to take up the challenge of being the Face of Philippine Triathlon. The 26-year old successfully defended the title he won two years ago in Singapore with a performance for the ages last Monday in Kuala Lumpur. 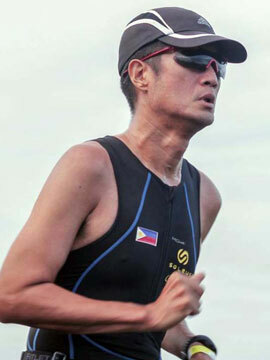 Huelgas negotiated the 1.5-kilometer swim, 40-kilometer bike ride and 10-kilometer run in a shade under two hours, 1:59:02. He towed with him teammate John Leerams “Rambo” Chicano (2:01:27) to complete a 1-2 finish for Team Philippines. The victory in the Malaysian capital capped months of struggle for Huelgas both physically and emotionally. Aside from the pain of daily workouts in the three sports, he had to endure being separated from his family and friends as he set up camp in faraway Clark, Pampanga followed by two months of acclimatization in Malaysia just before the biennial meet. Recently, Chooks To Go through Bounty Agro Ventures President Ronald Mascarinas feted the latest sporting hero upon his return. The company began supporting Huelgas’ effort since June of this year, beginning with regularly supplying him and his team with roast chickens for their meals. A graduate of Marketing Management from De La Salle University-Manila, Huelgas believes that best way to promote the sport on his part is to continue winning and bringing honors to the country. He cited the Triathlon Association of the Philippines (TRAP) for conducting races in the different provinces with the goal of discovering potential talent. For the moment, he intends to enjoy his victory and catch up by spending more quality time with his family and loved ones. However, it won’t last long as he is expected to sit down with TRAP officials and coaches to map out his agenda for the coming months leading to the 2018 Asian Games in Indonesia and hopefully qualifying for the 2020 Tokyo Olympics. “I look forward to competing in front of my countrymen when we host the next SEA Games in 2019,” said Huelgas in parting. Not bad for a kid who started out as a Badminton player in high school at Elizabeth Seton in Las Pinas City before eventually making the transition to the sport that has given him a place among Philippine sporting elite.